The Southwest remains in an ENSO holding pattern, with oceanic and atmospheric conditions still within the range of ENSO neutral over the last month (Figs. 1-2), and the forecasts and outlooks reflect that. On Aug. 9, the NOAA Climate Prediction Center (CPC) continued its El Niño watch, identifying persistent neutral conditions at present but with seasonal outlooks and models picking up on an increased likelihood of El Niño later this year despite a recent decrease in equatorial sea surface temperatures (see Niño 3.4 plot in Fig. 2 & sidebar for more information). CPC’s outlook indicates a 60-percent chance of an El Niño event developing this fall and a 70-percent chance of El Niño conditions this winter. On Aug. 9, the International Research Institute (IRI) issued an ENSO Quick Look noting neutral conditions in the oceans and atmosphere now but with warming subsurface oceanic waters pushing forecast probabilities for an El Niño event to just over 70 percent by the end of 2018 (Fig. 3). On Aug. 10, the Japanese Meteorological Agency (JMA) also identified neutral conditions in oceanic and atmospheric indicators and a 60-percent chance of El Niño by this fall. On Aug. 14, the Australian Bureau of Meteorology maintained its “El Niño Watch,” although most indicators were within the range of neutral. They, too, noted the warm subsurface waters in the Pacific Ocean despite recent cooling of surface waters and predicted a 50-percent chance of El Niño formation by the end of 2018. 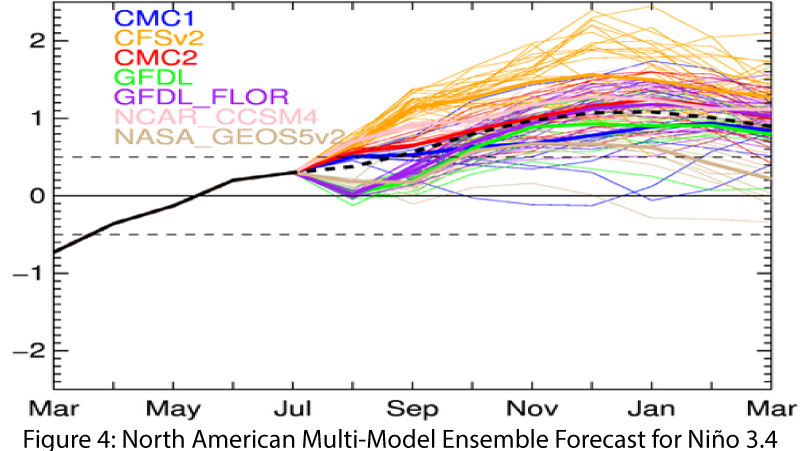 The North American Multi-Model Ensemble (NMME) is demonstrating the steady trend in observations and forecasts towards warmer-than-average ocean temperatures and is zeroing in on a weak to borderline-moderate El Niño event by the end of 2018 (Fig. 4). Summary: Despite a recent dip in surface temperatures in the Pacific Ocean, most outlooks have maintained an increased chance of a weak to borderline-moderate El Niño forming in 2018 with virtually no chance of a La Niña. Warm subsurface waters persist, and the forecasts suggest a return to warming sea-surface temperatures in the coming months along with a transition to atmospheric patterns more indicative of El Niño. 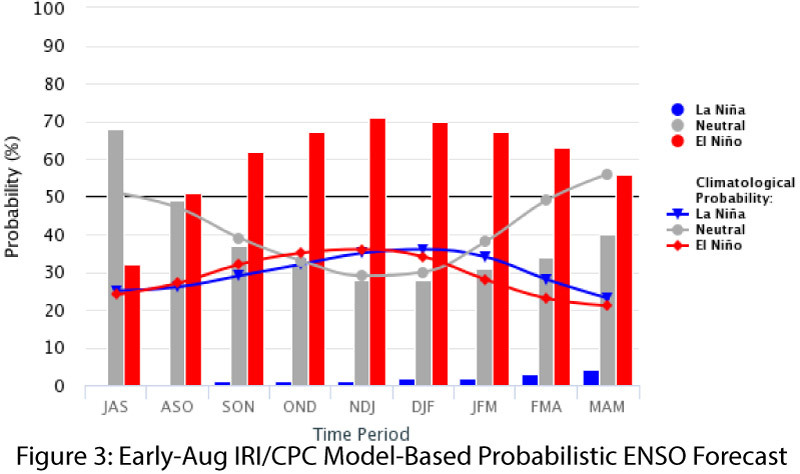 However, the formation of an El Niño event is still far from certain; the probabilities for neutral conditions range from 30 to 50 percent, depending on the agency and the timeframe, but are near zero for a La Niña event (see Fig. 3 for an example). 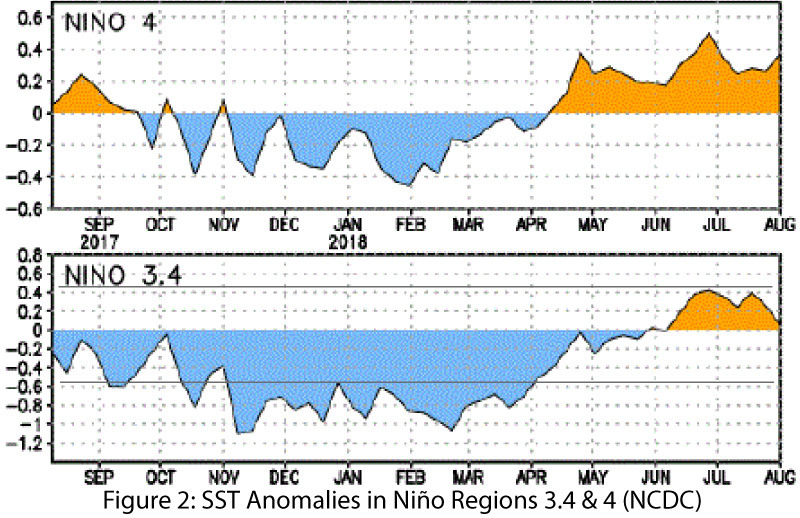 Presuming an El Niño event does form in 2018, the onset timing and intensity of the event will play a role in how much it affects tropical storm activity this fall and cool-season precipitation this winter and spring.